The picturesque city of Campeche is a relatively undiscovered jewel in the treasure trove of destinations that make up Mexico’s Yucatan Peninsula. 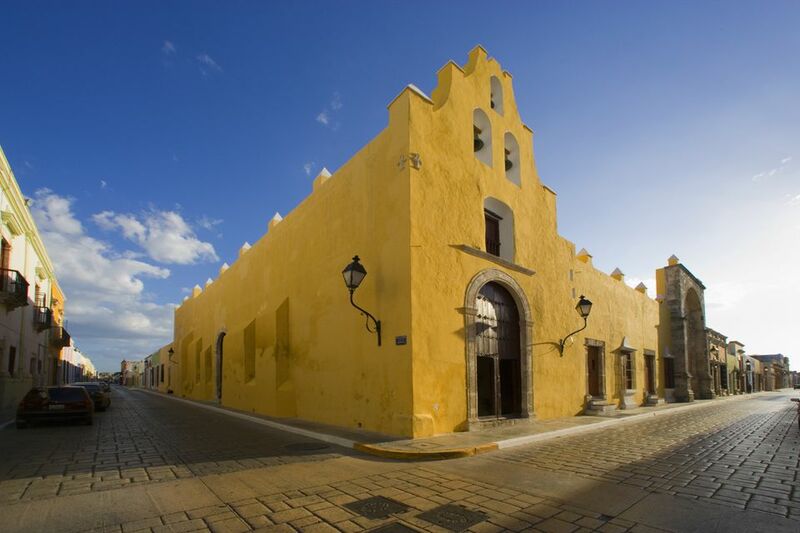 The capital of Campeche State, this colonial city was declared a UNESCO World Heritage Site in 1999. One glance explains why: the cobblestone streets, meticulously restored pastel-colored facades of row upon row of Spanish Colonial buildings and intact stone walls of the old city (built to repel the pirates that plundered the city in the 17th and 18th centuries) render the entire town postcard-perfect. If that sounds like a recipe for tourist overload, fear not: Campeche has mostly stayed out of the spotlight on this popular peninsula, which makes it a good choice for those looking for a respite from the sometimes-crowded attractions of the Riviera Maya. The city of Campeche is located southwest of Merida and northeast of Villahermosa, in the state of Campeche on the Gulf of Mexico. It borders the states of Yucatan, Quintana Roo, and Tabasco. Originally a Mayan village named Kan pech, Campeche was colonized in 1540 by the Spanish conquistadors, who established it as a major trading port. This brought it to the attention of pirates, who made repeated attacks on the town during the 1600s. A bane for the Spanish, to be sure, but a boon for 20th-century Campechanos, who trade on the romantic associations with piracy to support tourism, which, along with fishing, are Campeche’s major industries today. Stroll the streets of the centro historico, with its perfectly preserved Spanish Colonial-era buildings painted sorbet shades like peach, mint, ocher and egg yolk-yellow. While the facades are painstakingly restored—complete with handsome wooden doors, Juliet balconies, iron lanterns and all manner of 17th-century flourishes—a peek inside the barred windows often reveals deserted shells, overtaken by tangled foliage. People-watch in the Plaza Principal, a handsome square bounded by spreading carob trees, with a Rococo-style gazebo at its center. Monopolizing attention on the plaza’s east side is the magnificent Catedral de Nuestra Senora de la Purisma Concepcion, a Baroque limestone marvel with two soaring towers that dominate the skyline. The Museo de la Architecura Maya, housed in the Baluarte de Nuestra Señora de la Soledad (one of the city’s limestone bastions built in the 1600s to protect against pirates) is worth a visit for its thoughtful overview of Campeche state and the Maya archeological sites of note around the area. Speaking of which, be sure to reserve an afternoon for a trip to Edzná, the Maya ruins situated around 33 miles from the city. This impressive site, swathed in jungle, is definitely worth a visit. Those travelers conditioned to the turquoise-blue perfection of Mexico’s Caribbean coast might find Campeche’s waterfront a touch disappointing. Still, it’s worth a walk along the malecon (the waterfront promenade), especially at sunset, when the city is thrown into glorious relief. Hotel Francis Drake is a mid-priced, centrally situated 24-room hotel with large, air-conditioned rooms and a restaurant. The popular, 40-bed Monkey Hostel, located on the western edge of Plaza Principal, has balconies overlooking the street and a fun rooftop bar with unbeatable views over the square and the cathedral. The historic, 24-room Hotel Castelmar, painted a striking sky-blue, has a swimming pool with deck, a shady terrace and modern conveniences like wifi. La Casa Vieja is the ideal spot to watch the sunset behind the cathedral. Sit beneath the arches of the restaurant’s romantic colonnaded balcony, order a margarita or two and watch the play of light on the parroquia as the day fades. Another spot popular with tourists, Marganzo does a hearty line in regional specialties like baby shark panuchos, cochinita pibil and papadzules. Bonus (or fair warning, depending how you feel about these things): there’s also a roving mariachi band. The 24-hour café/restaurant La Parroquia is situated in a former garage, a cavernous space that’s popular with both gringos and locals. The food is uncomplicated and not particularly inspired, but it’s a nice enough place to chill. For a taste of the authentic local scene, head to Portales de San Martin, on Calle 49B in the barrio of San Martin just outside the city walls. Here you’ll find a row of simple family-run restaurants – Mananitas, El Cuadrilatero, Conchita Cervera—each with plastic tablecloths, tables on the street and basic menus featuring delicious, dirt-cheap panuchos and tortas. The scene is loud, lively and convivial. Campeche’s airport is located around 4 miles from the center of town, with flights to and from Mexico City and other destinations. Buses from various destinations, including Merida (around 4 hours journey) and Cancun (around 7 hours) arrive at the ADO terminal, a little more than a mile from the city center. Taxis into the city are cheap, around 300 pesos. Once in Campeche city, the historic center is easily navigated on foot, as are the barrios lying just outside. Many hostels rent bicycles, and taxis are available in the plaza principal for longer journeys. If you’re up for a rickety adventure, jump on one of the local buses in the main market, Mercado Principal, outside the city walls. How Can I Swim With Whale Sharks in Mexico? So much to see and do in Veracruz! These are our top 10 picks.